Such a wonderful “pop” of color for bedroom - The Marimeko design is such a great design - can’t wait to show others how great this looks! his pattern is a true classic and part of Marimekko's first floral collection designed in 1964. Due to its perennial popularity over the years, it has become synonymous with the brand. The design has been produced in many different colors, but by far the most iconic color way is the signature Poppy Red. However, the newer True Blue color way is just as appealing and brings a modern point of view to classic blue and white. This Duvet Set brings life to my bedroom. I love the quality and combination of colors. I would definitely purchase this again. Love..Love..Love..this Duvet Cover Set, it looks just as I thought it would. Wonderful feel and pop of red and hot pink color. I was encouraged to write this review by the Overstock customer care rep who helped with this return. She said that Overstock has too many items to QC everything, hence reviews like this are important. So here goes: Do not buy this duvet cover! The dye has not been set. I washed it in cold water/ delicate cycle as per instructions. When I pulled it out, the red had run everywhere! 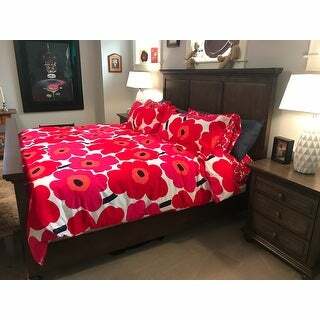 So the comforter is now red and pink flowers with splotches of red and pink where the white should be. what’s more, I washed my comforter with this new duvet cover and a comforter now has splotches of pink all over it – it’s ruined. This duvet cover is a very poor quality item, get something else! Beautiful colors, bright and modern with the large flowers. Bought this for a young girls bedroom with white bedroom furniture so this adds a real pop of color. Wonderful, colors are bright & cheerful, very white, gorgeous pink & orange, quality of material is excellent, easy button closure. I paired w/ a tailored bedshirt as a finishing touch, you can't beat cotton ! Love it ! My first duvet cover! It’s just like the he picture!! Exactly as stated in ad. Good quality, color is exact, size fits as expected. Love this piece. Took my boring bedroom and brought it to life. I would purchase this item again. I have loved this pattern since I first saw it in 1970. This duvet set is exactly what I was looking for. It makes me happy every time I make my bed. This duvet set is just as pictured. 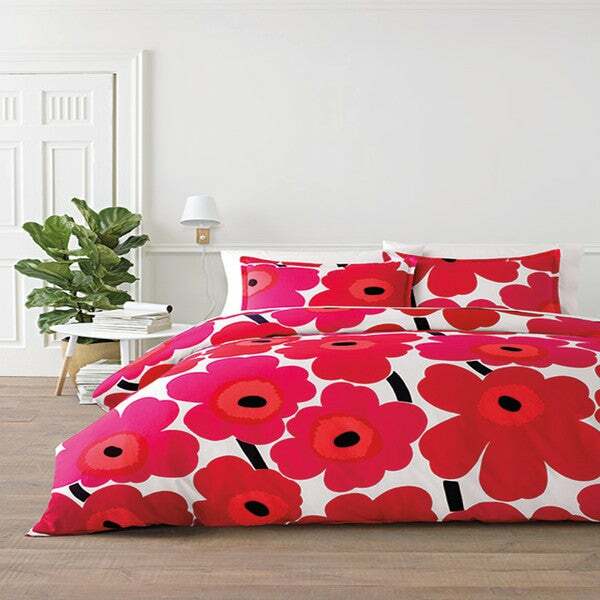 The Marimekko design is very bright, happy and stylish. It makes a statement and makes me happy. I paired it with black sheets but now looking for a stripe set. Wife loves this duvet cover,it is really well made, Super BRIGHT and a great fit. She loves it so much that she recently had me purchase the Blue one of the same design. Although a bit pricey it;s a great buy as it should last along time. Definitely recommend this item. Classic, Great bedding at an affordable price! Brings your bedroom to life! Beautiful colors and remain bright after washing. I added this to the sheet purchase and love it! It makes the room look cheery. And the quality of the thread count was unexpected. Very very good. Love this set in one of my guest rooms. Thinking of doing another set for me. I have always admired Marimekko prints, but their high end price has held me back from purchasing. Let me just say, I am so glad I indulged! This is a beautiful duvet set. Comfortable, oversized, vibrant, with a dense thread count. I can tell it will last a lot longer than the duvet covers I usually buy. If you can swing the price, you will not regret it! No mistake in purchasing this beautiful duet. Everyone has something great to say. Loving it. "is the pattern the same on both sides?" "Does it have ties to hold the duvet in place?" Classic Mid Century design is perfect for the room I'm doing. I wanted to add to my existing Marimekko linens. "Does the merit mecko poppy duvet come with euro shams"